For our older students, we provide a number of options and we highly recommend you stay in our halls of residence where you will benefit endlessly from the opportunity of being surrounded by other creative art students as well as the on-site dedicated welfare support. The primary accommodation for our over 18s is at Master’s House as well as Varsity House O18. Designed with your needs in mind, we aim to provide safe and secure accommodation but under more university style conditions, appropriate to our older students. We also offer homestay options for those over 18 who are interested in this. For our older students, life in CSVPA’s halls of residence is an enriching experience. With just under 80 bedrooms, Master’s offers an intimate social space for a group of like-minded creative individuals which helps to create a dynamic community, bringing opportunities, global contacts and lifelong friends. With a dedicated welfare and accommodation support team, we go out of our way to make sure you have the best possible university experience in a safe and secure environment. Each student room has a bed, wardrobe, desk and plenty of under-bed storage and draws. Our rooms are en-suite with private bathroom facilities. Free wireless access is available 24h hours a day throughout the building. The communal kitchens have a dining area, lockable fridges, generous worktops and are cleaned twice a week! You could not ask for a more stunning journey to College every morning. Master’s House is only an 8 minute cycle ride from CSVPA but your journey will take you over the River Cam and through Jesus Green, one of the most beautiful parks in Cambridge where you will find six tennis courts, band concerts on a summer Sunday afternoon, an outdoor swimming pool and BBQ area. It’s the perfect social space where students gather together to take in the inspirational sights and sounds of Cambridge. Alternatively if you want to catch a bus you can be door-to-door in 14 minutes. 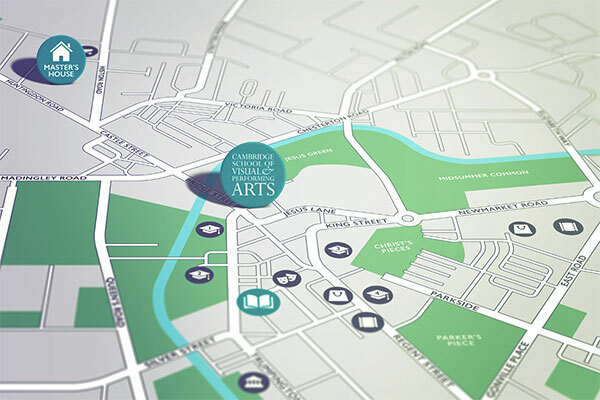 Being a creative arts student in Cambridge and having your accommodation and College so close to each other allows you to get the most out of your time here. Whether that is giving you the opportunity to spend more time in the studios working or time to explore Cambridge and hang out with your friends. Cambridge is hard to beat for something amazing to see and do. From cinemas and theatres showing a range of art house, independent, foreign and commercial films, to museums, concert venues, and a wonderful choice of shopping and nightlife in what is a vibrant cosmopolitan city.